Home » What Is In An Earthquake Kit? Workplace emergency plans in New Zealand should always include the plan in case of an earthquake. There are two items that should be clearly discerned when it comes to workplace earthquake preparedness: the grab bag and the earthquake kit. It is easy to conclude that the workplace emergency kit should equip you with all the necessary tools to sanitise any wounds, keep you fed and hydrated for a while, allow you to contact your family and the rescue teams and ensure basic sanitary needs. What Do You Put in a Grab and Go Bag? We already mentioned that the earthquake kit and a Grab and Go bag are not the same. The workplace earthquake kit is a necessary item that every New Zealand workplace should have. It should be used after the earthquake to make sure the consequences are dealt with. The Grab and Go Bag is also recommended for most workplaces and these are individual bags that each of the employees should assemble for themselves and keep close in case they need to evacuate immediately. Here is what you should find in an average Grab and Go bag. These bags need to be designed in a way that allows them to be carried easily. You can make a shoulder bag, but many people opt for a backpack since it is easier to carry and leaves both of your hands free. What Is the Safest Place to Be during an Earthquake? Where are you during earthquake? Outside Keep away from the buildings, street lights, electric posts. Seek open areas. Regardless of where you are, you should follow the instructions given by Get Thru New Zealand. The most important thing you should instruct your employees to do is to Drop, Cover and Hold. This means that all your employees should drop down so that they are not knocked down by the earthquake. In that way, they will avoid injuries from the fall. Together with your employees, you should identify the sturdiest pieces of furniture, usually the desks, that can be used as a cover from the masonry that can fall down from the ceiling and walls. Holding onto the shelter is also important because it will prevent people from sliding away from the shelter or, on the contrary, preventing the shelter from sliding away itself. Holding on also provides people with a feeling of security, much needed in a case of such emergency. This, together with the location of the workplace earthquake kits, is the essential piece of information in case the grounds start shaking – a fairly common occurrence in New Zealand. How Much Does an Earthquake Survival Kit Cost? The New Zealand price of earthquake survival kit for one person can be up to $260. This usually contains items that people would have in their homes, but rarely carry to their workplaces. Do you need to create, from scratch, these kits for each of your employees? Luckily for you, no. There are special workplace earthquake kits that you should use. Their price greatly depends on the size of your workplace and the number of people that are present in your workplace on a daily basis. The earthquake kits for 50 people should be a bit different than those for 5 people. That is something to consider once you plan your workplace emergency procedure and the equipment of your office. Putting together your own earthquake survival kits can be challenging. You need to make sure you buy all the necessary items, pack them in the appropriate way, so that they are usable in a case of emergency and to regularly check them and replace items if they have expiry dates. Therefore, managing your own earthquake kits can cost you time and money. The good news about the cost of your earthquake survival kit doesn’t have to be paid in full, all at once. Moreover, you don’t have to worry about replenishing the items in a timely manner. There is a much better option than buying the earthquake kits. You can rent them. Renting earthquake kits means that you just need to contact Alsco New Zealand. We already have emergency kits in our offer that are available to you for a flat, annual fee. Call us and we will discuss the size and the needs of your workplace. We will recommend the number of our emergency kits and we will deliver it to your doorstep. This is not all. Since even the first aid kits have perishable items, we will regularly come back and replenish the earthquake kits and replace the items close to their expiry date. That is all included into your annual fee. 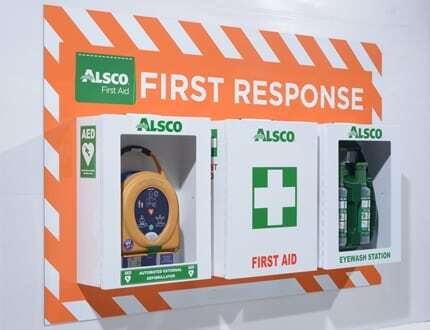 Call Alsco New Zealand now and get your best quote for a earthquake kit rental.